As if our life wasn’t already challenging enough, I have added a new wrinkle. My day job office is situated 3.3kms from the rest of my other jobs (and residence) and between the two there are plenty of things to see each day. The past few months I have attempted to walk to work every Friday which should take 30 minutes at a brisk pace. The trouble is I get super side-tracked and end up stopping off to take photos and end up arriving at work 10-15 minutes later than I should have. I am now a bit more savvy and in order to reach work at a respectable 8 am, I leave home an extra 5 or 10 minutes earlier to soak up some of the photo-op time. Friday just gone was a failure in my walking challenge and my photo challenge. I did take a photo on my new phone but it isn’t post worthy. I took some pretty photo’s on Thursday morning of a rose covered in dew, so I could pretend that was Friday…… the rose won’t tell. 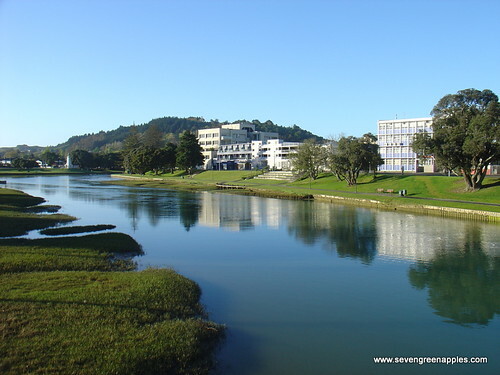 To inspire myself to continue with the FotoFriday challenge rather than have it fall over to a Failure Friday, I have looked back through my Friday photo’s…..
My first Friday walking to work I chanced upon a calm mirror-like Turanganui River which, at 1200m in length, claims the title of New Zealand’s shortest river. Despite not having taken my camera, I decided that my (old) phone would do the trick (and actually has more mega-pixels that my trusty 9 year old point-and-shoot). The second Friday was almost derailed by the weather. But new enthusiasm has a way of overcoming little obstacles such as wind and rain. We had a tramping trip planned for October and I needed to try out my new Trade-Me bargain jacket. The Anster likes to purchase tramping gear and my regular rain resistant jacket wasn’t quite good enough. And in this case we did score a very awesome bargain due to another kiwi leaving our shores to explore foreign lands. So the dawning of a miserable day was a great opportunity to test my new jacket and some swishy-swooshy sounding over trousers. Another glorious spring East Coast day and this time I am crossing another bridge. I have a choice of three bridges crossing two different rivers yet all within sight of each other. 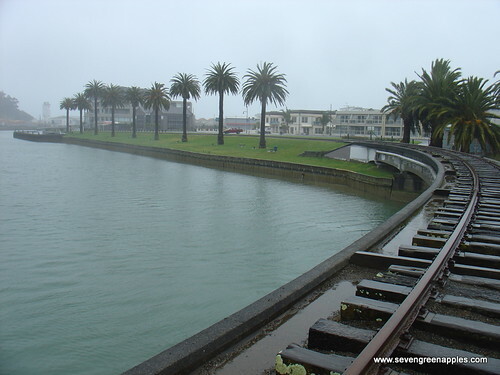 The Waimata & the Taruheru Rivers meet and become the short Turanganui River which carries the waters out through the harbour into the sea. Bridge 1 is a seldom-used rail bridge as seen in the above photo (there is no way I would be brave enough to walk on this bridge if it were possible a train might want to use the bridge while I am on it). 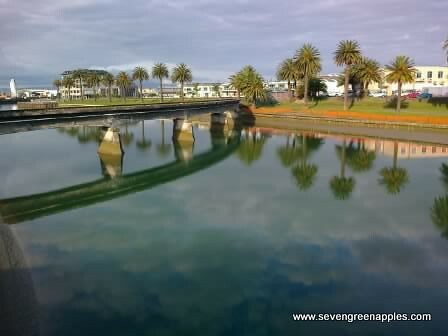 Bridge 2 is the Wainui/Gladstone Bridge – both these bridges cross the short Turanganui River. Bridge 3 is the Rutene/Ormond Bridge crossing the Waimata River, and having chosen this route to work, I then need to cross the Taruheru River on Bridge 4: the Fitzherbert Street Bridge. There are other bridges but I’d have to go out of my way to cross them between home and work so they’re not important right now. goAustralia.About.com says Gisborne is sometimes known as the city of Bridges and while I hadn’t heard Gisborne called that locally, I can understand why they might have named the city as such. I much prefer our first to sea the sun tag. 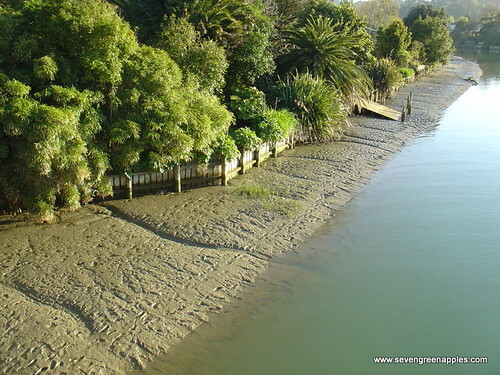 This entry was posted in Gisborne Life and tagged City of Bridges, First to see the sun, Gisborne, Taruheru River, Turanganui River, Waimata River by Jo Dohrman. Bookmark the permalink.